Chinese New Year or Lunar New Year is approaching soon and falls on the 8th of February. This year it will be represented by the Chinese zodiac sign of the Monkey, Nikolai was also born in the year of the monkey! I am sure those who are celebrating will be busy with baking yummy cookies, cleaning the house, getting new clothes, wrapping ang pows (red packets with money), etc. I'll be quite busy myself with the celebration followed by our wedding anniversary and Valentine's day, all on the same week! 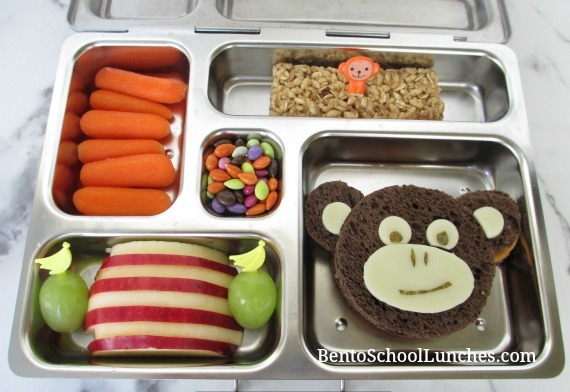 For this bento I made a simple monkey themed lunch with pumpernickel bread. I used a collection of circle cutters for the face. The largest was used to make the main head shape and to trim the ears which were made with smaller ones. For the eyes I used the smallest circle cutter on the provolone cheese as I had on the ears and a punch for the nori pupils. I freehand cut the larger provolone for the mouth and nose area and also the nori for the nose and mouth..
Main compartment - Monkey sandwich. Lower left - Organic apple slices and a couple of grapes with banana shaped picks. Center - Dye free choc covered sunflower seeds. Upper right - Organic granola bar with a cute monkey pick.